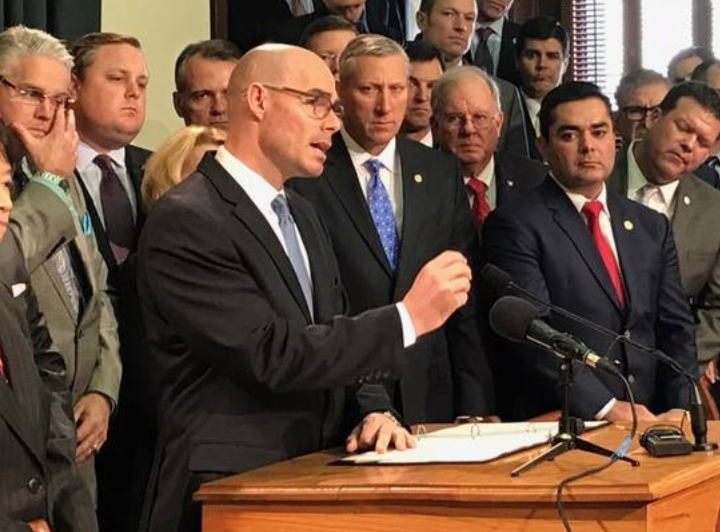 Bonnen, R-Angleton, is expected to announce later today that he has secured the necessary votes to be elected speaker on Jan. 8, 2019, the first day of the 86th session of the Texas Legislature, Harvey Kronberg, publisher of the subscription political newsletter, Quorum Report, reported. State representatives Drew Darby, R-San Angelo, and Tan Parker, R-Flower Mound, withdrew Monday morning after Phil King, R-Weatherford, and Walter “Four” Price IV, R-Amarillo, did likewise on Sunday. That sets the stage, Jones told The Texas Monitor, for House Republicans to nominate someone conservative enough to satisfy its majority while also having demonstrated he can work with Democrats. All four of his former opponents endorsed Bonnen for speaker. Jones, a Baker Institute for Public Policy political science fellow, said he would expect the other remaining Republican candidate, Travis Clardy, R-Nacogdoches, to drop out soon. Democrat Eric Johnson of Dallas also remains in the speaker’s race. House Republicans, after a rules change last December, are expected to select a preferred candidate from among their ranks in a vote preceding the general election on the House floor. The Republican Caucus distributed to its members cards to sign and return pledging fealty to the preferred candidate. Republican leaders complained when nearly two dozen House Republicans failed to sign the pledges, including several of the speaker candidates. Bonnen waited until two weeks ago to enter the speaker’s race and a couple of days later signed his pledge card. After learning that Bonnen had been asked to run by many of his Republican colleagues, state Rep. John Zerwas, R-Richmond, the first to announce more than a year ago, dropped out. Bonnen’s candidacy blunts conflicting pressures in the race for what is the third most powerful position in Texas state politics. The Nov. 6 election was widely predicted to reduce the Republican’s 95-55 majority in the House. As recently as a week before the election, Jones told The Texas Monitor he’d be surprised if the majority dropped below 90. However, with a flurry of upsets in Dallas and Tarrant County, Republicans head into the session with an 83-67 majority. House Republicans, pressed by their most conservative members, known as the Freedom Caucus, changed their speaker election rules specifically to block a Republican candidate from making a deal with Democrats to get elected. In Bonnen, Republicans have a candidate whose voting record is more conservative than any of the other announced candidates, and who therefore has no need to bargain with Democrats, Jones said. As speaker pro tem, whose job it was to substitute for outgoing Speaker Joe Straus for the past three sessions, Bonnen successfully navigated between Straus’ moderate Republican allies and their conservative antagonists, Jones said. Equally important, Bonnen has also demonstrated a willingness to stand up to Lt. Gov. Dan Patrick during the back-and-forth of bills being considered in the House and the Senate, he said. “Bonnen has a long track record of having the cojones to go toe-to-toe with Patrick, to show that the House isn’t willing to be pushed around,” Jones said.